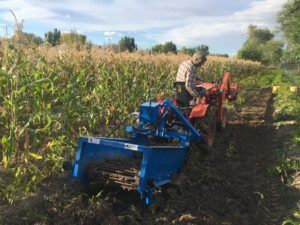 ussmallfarm, Author at US Small Farm Equipment Co.
Update on our equidistant planter! We just harvested the potatoes that we planted with our prototype equidistant planter. We are quite impressed with the results. The potatoes grew well. We also experimented with hooking one of our small diggers to a much smaller tractor than we originally thought possible. 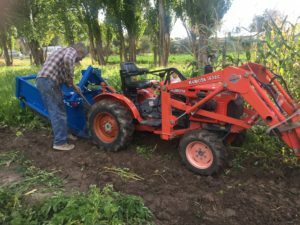 We dug the potatoes with a standard 26″ wide 3 point potato digger (US Small Farm one row potato digger, D-10M) using a Kubota 1700 hydrostatic tractor. We used extra weight in the loader bucket and the high pto speed. The tractor was unable to pick the digger out of the ground with dirt on the digger blade. But it did a good job! Plus, we were digging in mud! The ground was too wet but our weather is turning cold, so we felt like it was possibly our last chance to get them dug before they freeze in the ground. Any farmer can understand what we were up against! We are enjoying the fall weather and harvest season. Happy harvest to you! We’re not just manufacturers of equipment. We’re gardeners, too! Here in Wyoming the weather is just now getting to be planting season. We’ve had some warm weather but just went through another cold spell. 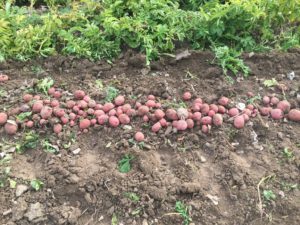 We do have our potatoes planted both in a conventional style using our P-10M one row potato planter, as well as, with an experimental equidistant one row potato planter. Eric likes to plant our garden in beds, so the style of the equidistant one row planter fits us well and seemed to plant accurately. You might enjoy this video explanation of how the equidistant one row potato planter plants the potatoes and how it planted accurately. We have now laid a drip line down the middle of each equidistant hill. Eric also designed and built this bed former to attach to our tiller to form our beds quickly, evenly, and smooth. We love the convenience of the bed former rather then digging out and shaping every bed by hand. Here is a photo of a few of our garden beds when we started this Spring. Its hard to get everything done in the springtime…. lots of garden work but equipment needs of our customers, as well! Maybe we’ll upload a video of the bed former running someday! Check out our equipment to make your life easier! 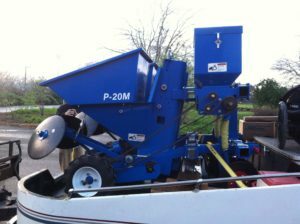 We have one or two row potato planters, one row diggers with options, seed cutters, hilling discs and more! 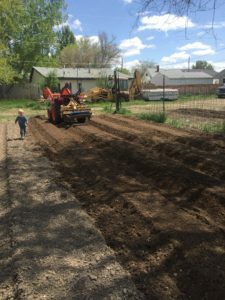 We enjoy making your small farm successful!